His dam KING LADY BIRD was bred by Steve Barr's long time friend Lowell Hankins, Rocksprings, Texas. MR STAN MAN had reining training, he is very athletic and a big stopper. 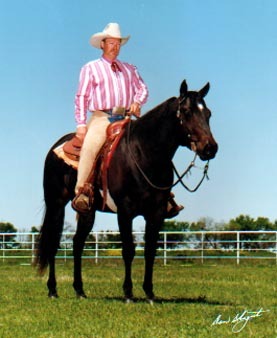 Because of the speed in his great grandsires THREE BARS (TB) and GOOD BIRD (TB) he crosses very well on Barrel Race mares, but he also produces good reining and roping horses. On a foundation bred mare he adds speed, size and versatility. He stands 14,3 HH, many of his offspring mature taller than he himself. His pedigree also shows the great sire LEO and goes back to KING P-234 six times.